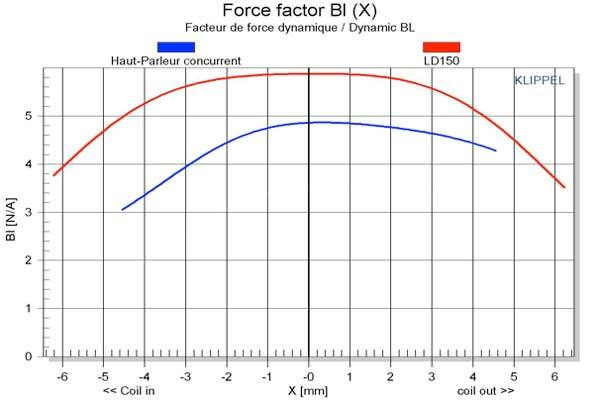 A great amount of studies done by our partner Atohm’s research and development team directed by Thierry COMTE led them to understand that the properties of the diaphragm material do indeed have a great influence on frequency response. However, the overall result is very closely affected by factors such as the rigidity and length of the coil former, the mass of the winding, the nature and quantity of adhesive used for the former/diaphragm seal, as well as the geometry, mass and viscoelastic properties of the peripheral suspension. Perfect “piston” movement by the diaphragm only exists for a limited frequency range. The directivity of a perfect piston always remains proportional to the dimensions of its emissive surface (and not its rigidity). The different cone and suspension break-up modes increase or reduce the sound pressure according to their amplitudes and phases. Beyond certain frequencies, the coil support ceases to transmit the movement and is deformed due to combined action of the cone and the mass of the winding. This buckling also plays a part in reinforcing or cancelling the overall displacement of the cone (you could say that the support acts like a “spring”). The moving parts unit forms an “indivisible whole”. As such, this “whole” needs to be optimized according to the goals to be achieved, without forgetting the absolute necessity of guaranteeing reliability and quality reproduction. Cone movement is perfectly uniform (in blue). In the low frequency, only part of the suspension’s surface is emissive. At 1000 Hz, the total suspension is emissive (provoking excess amplitude in the frequency response). The specific profile (LDS™ Technology) makes up for this excess amplitude by impending part of the suspension’s surface (in red). The goal was to produce bass/midrange drivers with a frequency response very close to the ideal, between 30 Hz and 4000 Hz. 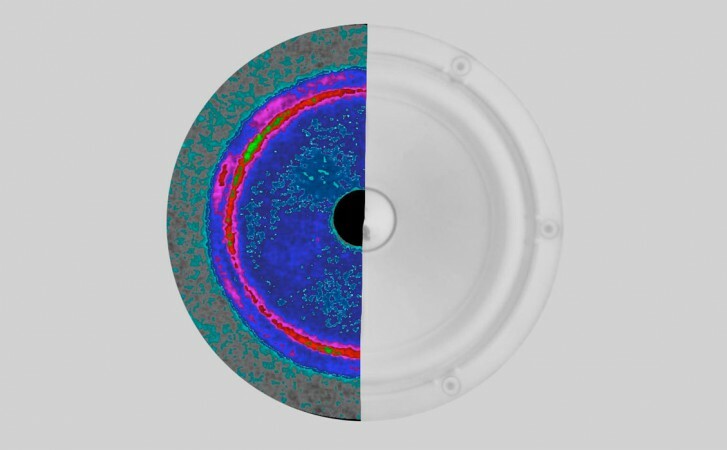 With these considerations in mind, the drivers’ cone are fitted with a diaphragm made out of special alloy, aimed at expulsing the audible break-ups out of this useful frequency range. Similarly, the cone is combined with a coil former made out of Kapton/Nomex in order to ensure perfect movement transmission in this nominal frequency range. In addition, this support with its adhesive seal, limits the transmission and absorbs part of the energy. These units have also been fitted with a peripheral suspension featuring a special profile which favors progressive break-up (LDS™ Technology) without noticeable hitches in the useful frequency range (typically between 700 Hz and 1800 Hz for the LD150). 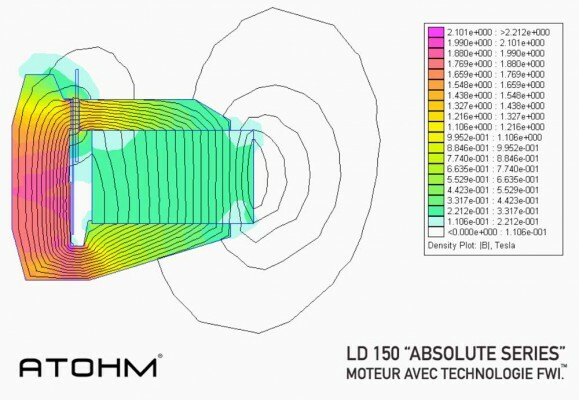 Drawing on simulations (finite element method) and measurements by laser interferometry, Atohm’s team optimized the numerous interactions and made precise adjustments to the geometry of the moving parts unit. The frequency response of the driver is characterized by exceptional linearity along the useful frequency range. Further along, the response is corrected with an adapted filter. By using rigid materials and perfectly stable adhesives, the performances are entirely duplicable from one unit to another maintaining a high degree of precision (which cannot be said for a paper diaphragm or one made from Kevlar®, for example). The bass/midrange drivers Absolute Series was the object of a great deal of research aimed at getting as close as possible to the ideal functioning parameters. The loudspeaker is an electromechanical unit featuring a diaphragm which reproduces the musical signal by oscillating around its rest position (point 0). The driver diaphragm must, therefore, oscillate perfectly symmetrically around this position. Its movement must be identical and proportional to the excitation signal. However, its elements (suspensions) and the electromechanical characteristics of the motor (force factor, inductance…) are subject to variations which change the “theoretical” movements of the diaphragm. These variations, also known as “non-linearities”, have an effect on the excursion of the moving parts and create what is more commonly known as distortion. These are the factors which determine and limit the excursion capabilities of the moving parts. Based on that assumption, particular care was taken in designing these transducers, using powerful modeling tools in order to reduce all forms of distortion. The different parameters to be taken into account and optimized as far as possible were: the symmetry and the linearity of the stiffness coefficient of the suspensions (dynamic stiffness coefficient curve of the suspensions), the force factor resulting from the current running through the coil and the magnetic flow concentrated in the air-gap (dynamic force factor curve), as well as stability of the inductive value of the loudspeaker coil (dynamic inductance variation curve). The loudspeaker diaphragm is held by its suspensions (peripheral suspension and spider). These suspensions act as a return spring. To be perfect, the stiffness coefficient of this unit should be perfectly constant and symmetrical (F= k*X) but in practice the latter is neither linear nor symmetrical. The return force produced is therefore no longer directly proportional to the required displacement. In some ways, this prevents the diaphragm from placing itself in the precise theoretical position that the moving coil tries to force it into. As a result of detailed research and many experiments, the Atohm peripheral suspension and spider were optimized to obtain a stiffness coefficient which is noticeably constant and perfectly symmetrical. Their respective geometry and mechanical summation allow them broad excursion capabilities. Additionally, being designed with a specific profile (LDS™ technology), the suspension progressively breaks up in the midrange frequencies (between 700 and 1800 Hz). Finally, the materials which make up these units have been specially selected and offer the guarantee of top reliability as well as perfect stability over time. 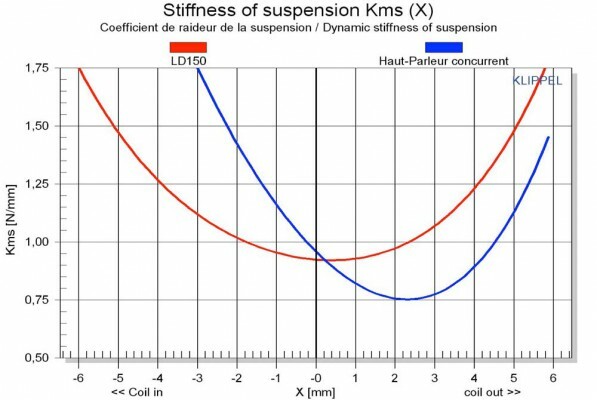 As you can see on the curve on the right, the KLIPPEL® system maps the stiffness coefficient resulting from the sum of the peripheral and central suspensions (Kms) according to the excursions of the moving parts (X). To the left of point 0, the excursion is negative, corresponding to the coil entering the motor and to the right of point 0, the excursion is positive, corresponding to the coil’s exit from the motor. 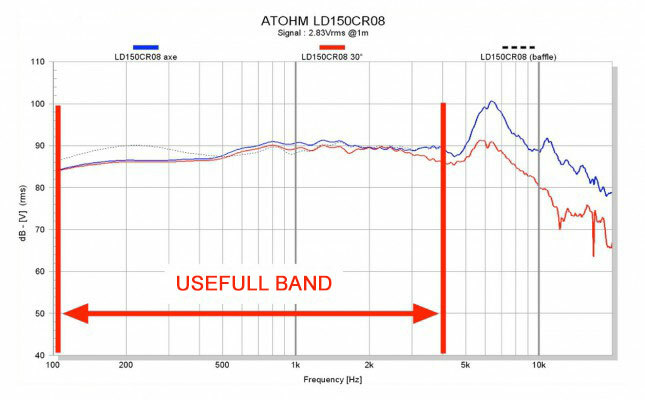 The blue curve represents the measurements taken from a competitor’s loudspeaker. You may notice that the asymmetric coefficient is very high… The minimal stiffness point is situated at about +2mm from the rest position. During its excursions, the diaphragm therefore tends “to go back to” this minimal point instead of oscillating freely around the position 0. The red curve represents the measurements for the LD150. It is almost symmetrical in terms of the stiffness coefficient, representing better mechanical power handling, improved dynamic capacities and reduced distortion. Reducing distortion, it is rendering the stiffness coefficient as linear and symmetrical as possible over a broad excursion range. The driving force applied to the diaphragm (BL) is the result of the electric current flowing through the moving coil and the magnetic flow produced by the magnet in the air-gap. In theory, this flow should be constant whatever the coil’s position but in practice it is highly dependent on the geometry of the polar parts on the one hand, and on the other hand, it is modulated by the alternating current generated by the moving coil. Indeed, as a result of the current, the coil generates its own magnetic field. The latter does not contribute in any way to creating the driving force. This alternating magnetic field has an interfering effect and clearly disturbs the constant flux of the magnet. Alternatively, it increases or reduces the value of the constant flux in the air-gap. Moreover, this disturbance is proportional to the electric current flowing in the coil. Simultaneously, another parameter also disturbs correct coil displacement. By definition, when the coil moves, it is successively pushed towards the exterior of the motor and then towards the interior. The inductance of this coil is strictly related to the position with regard to the polar parts (ferromagnetic material), passing in turn from a low value to a high value. According to the rule of maximal flow, the moving coil is “attracted” towards the interior of the motor, where the inductance value is at its highest, in such a way that the (disturbing) flux that it generates is at its maximum (a current powered coil is always more attracted towards ferromagnetic material than towards air). The coil is therefore subjected to an additional force (known as magnetic reluctance force) which disturbs the driving force. This magnetic reluctance force is one-way (independent of the current direction) but remains proportional to the amplitude of the current flowing in the coil. Furthermore, the inductance variations lead directly to dynamic impedance variations. Optimized by the finite element method, the FWI™ technology motor has been designed in such a way as to produce a high force factor, which is perfectly symmetrical over a very broad excursion range. We equipped the motor with a powerful ferrite as well as polar parts designed to enable maximum magnetic flow. The flow density within the air-gap reaches 11000 gauss in the LD150 air-gap (height of 6mm). 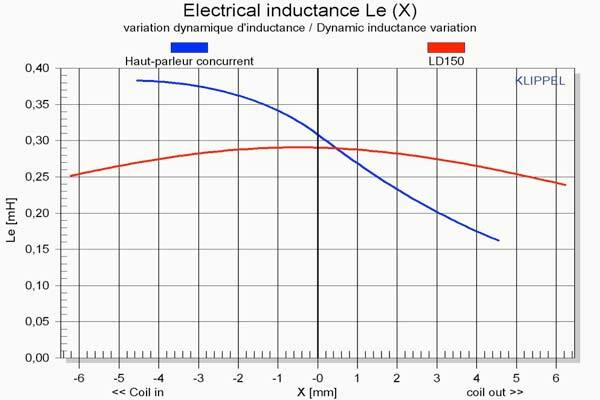 Coil interaction interferences have been taken into account in such a way that the inductance value remains very low and constant whatever its position. To obtain this, a specific geometry was designed for the core and for the copper ring which fits onto it. To satisfy the different electromagnetic factors, their proportions and dimensions were the object of a great deal of research using simulations and prototypes aimed at satisfying these electromagnetic criteria. Our aim was also to ensure optimal extraction of the heat generated by the moving coil and correct motor decompression. The blue curve represents the measurements taken from a competitor’s loudspeaker of similar size. You may note that there is a high level of asymmetry for this factor. It remains relatively constant when the coil exits the motor but it falls very rapidly when the latter re-enters the air-gap. Diaphragm movement is severely hindered on the negative half waves. When coil excursions are large then performances become very unstable. The winding tends to “slip away” from the central point and oscillates at the back of the motor (where the BL value is the lowest) instead of oscillating freely around the 0 position. The excursion and dynamic capabilities of this unit are very limited. Distortion appears even on short excursions. The red curve represents the measurements for the LD150. This curve presents a better leveling off as well as perfect symmetry. The excursion capabilities are better and the coil always oscillates around the reference point with no instability. The harmonic distortion level remains very low over a broad excursion range. On the two curves here, the KLIPPEL® system maps the force factor of the motor (BL) according to the excursion of the moving parts (X). To the left of point 0, the excursion is negative, corresponding to the coil entering the motor and to the right of point 0, the excursion is positive, corresponding to the coil’s exit from the motor. Reducing distortion, it is rendering the magnetic flow in the motor constant and symmetrical whatever the circumstances. It is also ensuring that the disturbance flux produced by the moving coil remains as weak as possible over a broad excursion range. The blue curve represents the measurements taken from the same loudspeaker as in the preceding test. It is worth noting that there is a high level of variation and the inductance value is totally asymmetric. The latter value is very high when the coil plunges into the motor and it is low when it exits. According to the current amplitude flowing through it, the coil is inevitably “attracted” towards the back of the motor (where the inductance value is the highest) instead of oscillating freely around the 0 position. The result of this phenomenon is the creation of third order harmonic distortion. In addition, this inductance variation leads to high dynamic impedance fluctuation (fluctuation of around 2 ohms at 1000 Hz when this 4 ohms loudspeaker operates at +/4mm in the low frequencies). The result is high intermodulation distortion, in addition to the distortion due to “current flow” if the amplifier is not designed to handle such fluctuations. The red curve represents the measurement of the LD150. This graph shows the almost total inductive linearity of the moving coil (and therefore its perfect symmetry). The coil is therefore not “attracted” towards the back of the motor and oscillates freely around the 0 position. The third order harmonic distortion rate is drastically reduced. Furthermore, with the variation being almost nonexistent, the dynamic impedance of this unit remains perfectly stable. Intermodulation distortion is therefore very low and the amplifier can perform in much better conditions. On the two curves here, the KLIPPEL® system maps the inductance value of the coil according to the excursion of the moving parts (X). To the left of point 0, the excursion is negative, corresponding to the coil entering the motor and to the right of point 0, the excursion is positive, corresponding to the coil’s exit from the motor. Reducing distortion, it is rendering the inductive value of the winding as low, constant and symmetrical as possible over a broad excursion range. ATOHM’s « Absolute Series » drivers are equipped with exclusive frames made out of injected aluminum. Their shapes were designed according to their functions and take into account mechanical, acoustic, thermical and aesthetical constraints. The ATOHM’s frame is extremely rigid, providing the perfect mechanical support to the driver unit as a whole. Thanks to its thick, ribbed crown shape, it is attached firmly to the cabinet. Altogether it has 18 fine spokes which play an excellent role in optimizing rear wave flow. The rear volume of the spider features tiny openings which provide adequate ventilation, and also limit the possibility of potentially harmful particles entering the volume. The motor is fixed solidly to the frame along a wide base plane using screws and special adhesive. Finally, due to its material composition and the large surface area, the basket plays an active role in cooling the loudspeaker by evacuating the calories accumulated within the motor.